Show relationships within a hierarchy. Compare levels of importance in related concepts. Detail steps in a process or methodology. 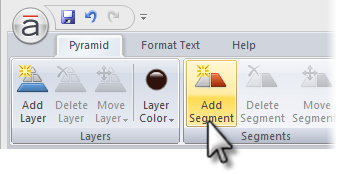 Steps: Located in the upper left corner of the editor, this panel is used to manage the layers and segments for your Pyramid. 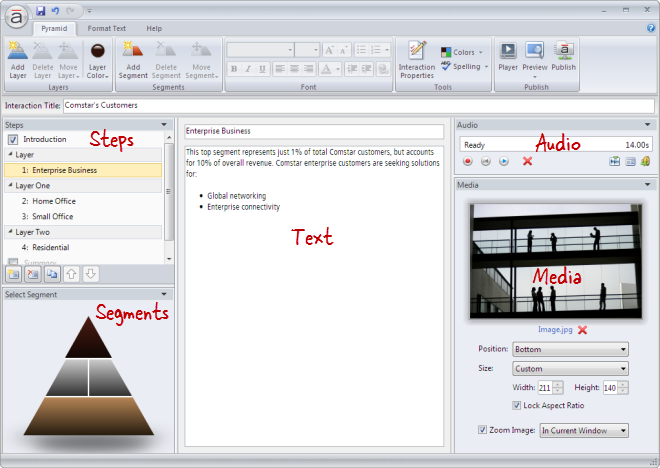 Segments: Located in the lower left corner, this panel is used to select segments of the Pyramid for editing. 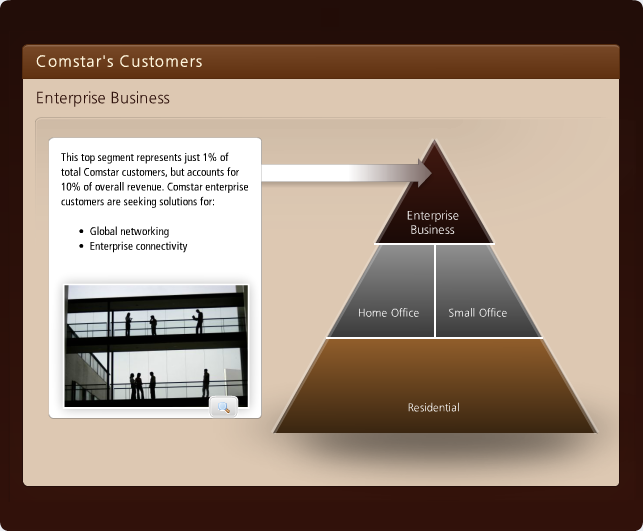 It also provides a dynamic preview of the Pyramid's layout. 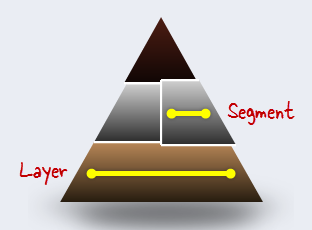 Each step in a Pyramid interaction is called a segment, and segments are grouped into layers. Go to the Pyramid tab on the ribbon, and click Add Layer. New layers get added to the bottom of the pyramid. Go to the Pyramid tab on the ribbon, and click Add Segment. 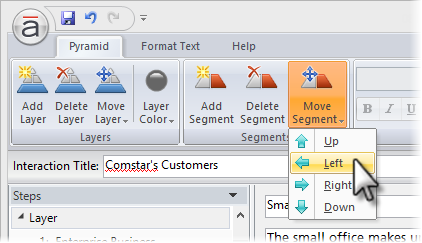 New segments get added just below the segment that's currently selected in the Steps panel. 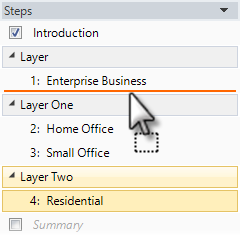 If an entire layer is selected, new segments get added to the end of the layer. Segments can't be added to the top layer, introduction, or summary. 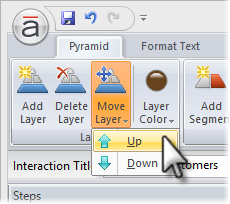 Tip: A Pyramid interaction can have up to 11 layers and up to 20 segments per layer. 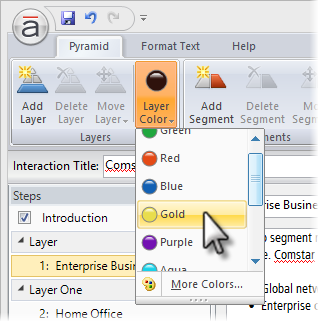 Go to the Pyramid tab on the ribbon, and click Layer Color. Go to the Pyramid tab on the ribbon, click Move Layer, and select either Up or Down. Go to the Pyramid tab on the ribbon, and click Move Segment. 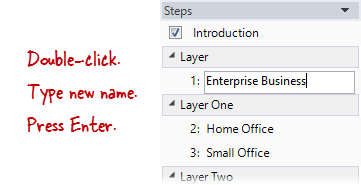 Select either Up or Down to move the segment to a different layer. Select either Left or Right to change its position on the same layer. 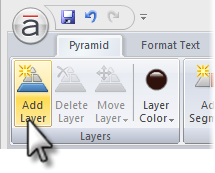 Go to the Pyramid tab on the ribbon, and click either Delete Layer or Delete Segment. Tip: You can't delete the introduction or summary, but you can hide them. 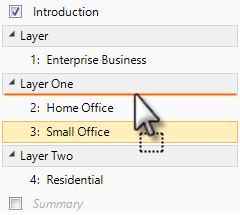 Similarly, a segment can't be deleted when it's the only one on a particular layer. 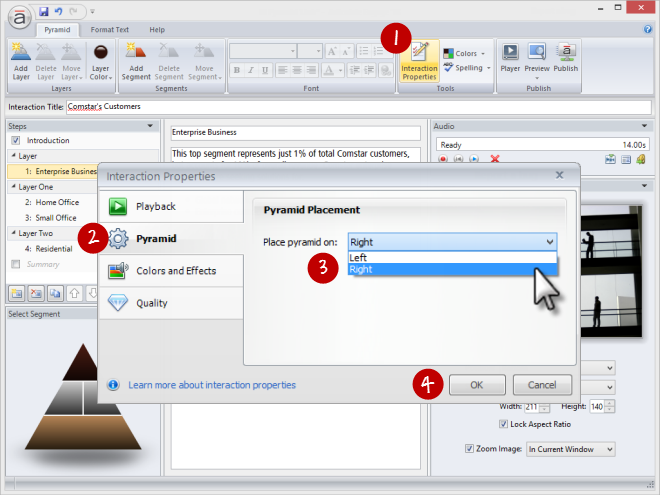 Go to the Pyramid tab on the ribbon, and click Interaction Properties. Select the Pyramid tab on the left side of the window. Choose Left or Right from the Place pyramid on drop-down.